When San Francisco’s Arts Commission removed a controversial statue from Civic Center that depicted a fallen American Indian beneath a looming missionary and a vaquero in a pose of yielding a whip, it left an empty platform on the Pioneer Monument. But over two days last week, the platform between the Main Library and Asian Art Museum came to life as more than a hundred Native Americans climbed onto the pedestal to have their picture taken in the statue’s place. Joe Rosato reports. When San Francisco’s Arts Commission removed a controversial statue from Civic Center that depicted a fallen American Indian beneath a looming missionary and a vaquero in a pose of yielding a whip, it left an empty platform on the Pioneer Monument. But over two days last week, the platform between the Main Library and Asian Art Museum came to life as more than a hundred Native Americans climbed onto the pedestal to have their picture taken in the statue’s place. “It’s powerful to be able to see our community up there instead of that statue,” said Vincent Medina, a member of the Mowek Ohlone tribe. The two-day photo project was organized by the San Francisco Arts Commission as a way to re-activate the space in a way that gave the community a hand in its message. Organizers expected some 150 people of American Indian heritage to participate, ranging in age from two to ninety-two. Over last Friday and Saturday, American Indians — many dressed in traditional and ceremonial garb — climbed the steps onto the platform via wooden stairs installed specifically for the photo shoot. Photographer Hulleah Tsinhnahjinnie of the Bear Clan of the Taskigi Nation stood on a scaffolding taking the photos, as an assistant gave instructions over a bullhorn. Ninety-year old Julia Parker of the Kashia Pomo and Coast Miwok tribes made the journey from Yosemite Valley where she’s lived the last seventy years. She posed for a family photo dressed in a pink blouse with a crown of white feathers woven into her silver hair. “I think it’s about time that people begin to recognize and respect each other and how they feel,” Parker said watching people pose on the pedestal. Across the plaza, photographer Britt Bradley used an antique box camera to capture black and white images of the subjects, using antique glass plates which yielded ghostly, dramatic images which she printed in a tent. The removed statue, entitled Early Days, was dedicated as part of the Pioneer Monument in 1894. But over the last two decades it had generated controversy as Native Americans objected to the depiction as a painful reminder of the abuse suffered by their ancestors. The San Francisco Arts Commission removed the statue in pre-dawn darkness last September. A Petaluma attorney has since filed a lawsuit to try and force the city to reinstate the statue to serve as a lesson of the horrors of the past. Arts Commission staff did not comment on the pending litigation. But during the event, a gentle drizzle didn’t damper what turned into a celebration as people scaled the monument’s pedestal to pose for photos. 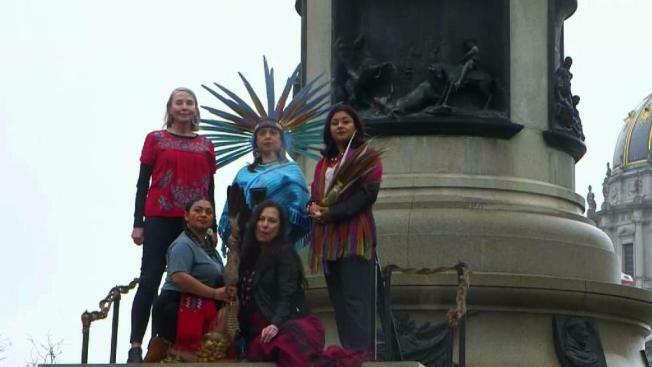 Ursula Jones wore a headdress of brown feathers and numerous bead necklaces, standing in front of the monument with her children and grandparents. The images captured during the event will appear in a series of exhibitions beginning this summer as the city rolls out a new American Indian initiative. The events are intended to coincide with the 50th anniversary of the American Indian occupation of Alcatraz. San Francisco Supervisor Vallie Brown who is of Native American heritage stepped onto the pedestal with a group and raised a fist, the dome of city hall flanking the pose. “I think this is really going to really show people who Native American people are around here and San Francisco,” Brown said. Jones gathered her family on the pedestal, their clothing a pop of color against the gray San Francisco morning as the smell of burning sage wafted across the plaza. The photographer’s shutter clicked, triggering a bolt of flash as Jones lifted a fist in the air. “I just think it’s important for people to realize we’re still here,” she said.